Kansas City is our hometown, and it is sometimes overlooked as both a destination as well as a place to get a great cup of coffee. Unbeknownst to many, the cafe scene is growing quickly with new cafes and roasters popping up all over. The SCAA USCC Qualifier competition is coming to KC in just a short few weeks, so we figure you should check out these cafes if you are visiting. Kaldi’s Coffee is actually a Saint Louis based coffee roaster who has a number of cafes in the KC area. These stores, previously named ‘Latte Land’ have been transitioned to the imagery and quality standards of Kaldi’s. The offerings are what we have come to expect from a quality cafe; service, coffee, and atmosphere that please the senses. Look for their single origin pourover offerings, or a traditional cappuccino for a nice treat. Seasonal drinks and their recently acquired tea company offerings round out the menu. PT’s Coffee Roasting Co is based in Topeka, KS but their newest cafe is located right here in the heart of KC. The space is big and open, and the rotating pourover coffee list has some killer options. They also have a solid food menu (we recommend the breakfast biscuit sandwich!) to sate your cravings as you hang out. PT’s is one of the original Direct Trade focused companies, and their coffee selection reflects the potential of these relationships with farmers. Don’t forget to grab a bottle of cold brew for the road as well. A relatively new entry in the Kansas City cafe scene, Thou Mayest takes an approachable stance on their service while offering high quality coffee and alcohol. They currently roast their coffee in the store to ensure it is as fresh as possible. While this is definitely a cafe, the cocktail bar is quite a sight and worth checking out in the evening (I’m not going to judge if you get an old fashioned at 11am though). The interior imagery is like an old camping excursion set to modern upbeat music. Quay Coffee is a hot spot for coffee lovers in the River Market area. They offer a relatively simple lineup of pourover and espresso drinks in a multi-roaster approach, which has been quite satisfying in our experience. Seats are often hard to find in this space, mostly because it is a great place to sit and do some work. The neighborhood is worth checking out as well, so find a parking spot and walk around for a bit. Parisi Artisan Coffee is an example of a cafe mixing the old and new to create its own identity. Their original cafe is inside of the beautiful Union Station building, and the image of a fine Italian cafe seems to be the inspiration for its styling. Parisi offers seasonal drinks and delicious flavored syrups made in house if you need a touch of sweetness. They don’t offer batch brewed coffee, but pourovers are available as well as ready to serve french press coffee. Blip Coffee is one of the newer roasters in KC, located in the West Bottoms area, which is packed with tons of cool older buildings (and even a hobbit hole!). They are focused on approachable coffee with the local community in mind. 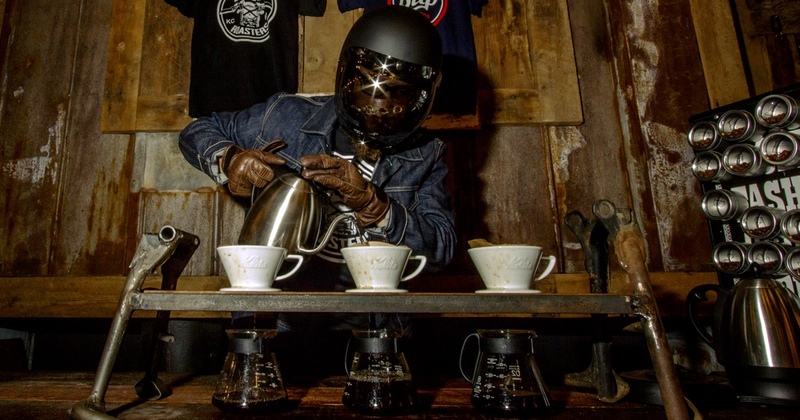 The owners are connected to motorcycles in a big way, and sell leather goods, gloves, and helmets in addition to their fresh roasted coffee. The offerings are limited, with a batch brewed coffee, coffee of the day, and espresso options standard. Don’t come planning to camp with your laptop because this is a standing room only coffee bar. * Blip suffered from a fire in their building (not their fault) not too long after this list was posted and is not open at this time. There is a donation page to help them rebuild, and they are planning to make a pop-up during the USCC event as well! The Roasterie is one of the original modern specialty coffee roasters in Kansas City. There is a distinct theme of aviation in their roasting facility cafe, punctuated quite boldly by an actual DC-10 airplane on the roof of the building. Known for their coffee’s deep rich tones, it’s hard to find a local in KC that doesn’t know who they are. It’s worth checking out, even if it’s just to gawk at the plane. Filling Station is full of windows. It is open and spacious, with plenty to satisfy your food and beverage needs. They have a small kitchen menu, fresh juice, pastries, and of course your standard coffee offerings. The original Filling Station location is in the Union Hill neighborhood, and it has the feel of a small park since it is essentially an island in between streets. One of the cafes on this list geared for sitting and getting work done, expect to weave between the students and business people plucking away at their laptops. As with any local watering hole it gets pretty lively at times, so if you’re looking for your social fix give this one a shot. Oddly Correct has been somewhat of a catalyst for the recent coffee company boom in KC. They started small, roasting coffee and offering simple pourovers and ultimately expanded to a full cafe. They only offer a small number of single origin pourovers and usually two espressos (one single origin, and one seasonal blend). Oddly Correct makes a statement by not having sweetener or cream available for coffee, encouraging their customers to savor the beauty of the coffee itself. Broadway is one of the long time coffee companies in KC, with a high reputation among the locals due to their infamous shuttering of a Starbucks nextdoor. Stylistically, they are specialty traditionalists in the sense that they focus on lower acid espressos and more ristretto style extractions. Located in Westport, they have two locations to serve you- the O.G. (on Broadway just south of Westport Rd) and their cafe and roasting facility (4012 Washington St). Can’t decide? No sweat. It’s just a 3 minute walk from one to the other! The Doughnut Lounge might be the newest business on our list, as it only recently opened in the Westport area. Obviously if you are in need of doughnuts while in the KC area they will take care of your gluttonous desires, but an added perk is that they have a high quality coffee service to go along with it. Another multi-roaster concept, on our last visit they were featuring coffees from Post Coffee (on this list) and Madcap Coffee (from Michigan). To top it all off, their cocktail bar is no joke either. So no matter the time of day you can find something to keep your taste buds satisfied. Crows Coffee is reminiscent of the old guard cafes we remember when we began working in the industry. Serving the campus of the University of Missouri-Kansas City, Crows brings back all the feels of our college days and their hours of caffeinated study. The coffee selection is relatively standard, espresso drinks, batch brewed coffee, cold brew, and single origin pourovers. Crows excels in providing the “Third Place” where you can find a comfortable space to drink coffee, work, or just be social. Kansas City has a rather extensive suburban sprawl, which means that doing much of anything without a car can be impossible. Recently growth in the city center has enriched KC and made the food and beverage scene much more connected and easily found, but that doesn’t mean you won’t find great places further out! Luckily we also have very light traffic compared to many cities, so a trip down the highway is usually quite fast. Second Best Coffee carries the tagline of “Midwestern Modesty”, which is meant to evoke approachability and the name is in reference to a constant quest for improvement. They are a little off the beaten path, in the Waldo neighborhood which has a number of noteworthy bars and restaurants. Second Best has recently started roasting their own coffee and they offer some coffee geekery such as the “Slayer show off” drink flight. It is styled with bicycles as a theme, so if you are an avid cyclist this may well be worth your time. 1900 Barker is not a short drive from downtown KC, but it is certainly worth it. They have implemented what we consider one of the best cafe executions in the area. It is a multi-roaster concept with very high standards, serving small batch brews and standard espresso drinks as well as seasonal specialty drinks that highlight the coffees quite well. The other half of the business is artisan bread and pastry, which carries a level of quality at least equal to that of the coffee service. If you are willing to make the drive you won’t be disappointed. This cafe is located in Lawrence, KS home of the University of Kansas, so there is plenty to see if you make the trip (Freestate Brewery is always a nice treat). The above is far from an extensive list of cafes in the KC area, but we feel that these will give you a good experience of the Kansas City coffee scene. Our friends at Beverage Life have put together some fantastic tour maps with an extensive listing of all of the major cafes in the area. Whether you check out one or multiple spots, welcome to Kansas City. We hope you enjoy! Love this list. Thanks for listing their proximity to the event center. Little Freshie and Sasha’s Baking Company are two honorable mentions that are both incredibly close to the convention center, within walking distance if you can manage a couple block walk. Good spots Kate! There are tons of great places in KC, so don’t forget to check that link from http://www.beveragelife.com for a full rundown too. I am surprised Mud Pie Coffee Shop did not make the list. This is a specialty vegan coffee shop that makes their own tasty almond milk. A must try for those who have not been there. I agree that Mud Pie is a nice spot. There are so many places around KC these days and we and choose a bit. Thank you for mentioning them! My personal favorite is Scooter’s Coffeehouse at 103rd & Antioch in Overland Park. Their flavored coffees are insanely good, and they don’t have the bitter/burnt taste of other places I’ve run into. What about the one that started it all? Y.J.’s at 18th and Wyandotte home to the “orginal 12” a group of artist and visionaries that brought the crossroads back to life. How is The Roasterie on this list and Second Best gets only an honorable mention? There are some really average spots on the list, and Second Best is easily top 3 best shops in town. Thanks for taking the time to check out the article! If you take a look through the headings, you may see that it is structured in a format of distance from the city center/convention center where many will be staying during the event. Within a 5 mile radius of the convention center there are far more than 12 cafes, and we chose the places worth visiting, whether that be because of a superior cup, service, atmosphere, or KC cultural significance. While the Roasterie isn’t personally my favorite cup of coffee in town, us locals know that they have a rather fanatic following here in KC. On top of that, looking back from a historical perspective, they are one of the companies responsible for building the specialty coffee industry in Kansas City over the years, hosting the first 5 Midwest Regional competitions a decade ago. When I visited to take the photo for this article I had a cup of filter that was acceptable (better than I remembered actually). 1) They are a solid cafe, which is why they were honorably mentioned, despite the distance. 2) They are not “on the beaten path” as the article says, which isn’t a big deal but we think it’s definitely worth seeking out! 3) This article is not intended to act as a ranking or direct advertisement for any one company. It is about the cafe culture in Kansas City, which is meant to be inclusive to not only professional tastes, but other perspectives as well. And, of course, a bit of Midwest hospitality for all of our out of town coffee friends. Thank you for the opportunity to clarify our message and thanks for reading! RiverMarket Coffee House is a must as well! Excellent roast, done on site! Thanks, Pete! Excellent article….and I like the format / approach you took! As a novice in the coffee industry, I’m impressed with the coffee excellence Kansas City has to offer. Thanks for spotlighting a number of places (some of which I’ve already enjoyed) and pointing out other opportunities! Thanks for being a Kansas City coffee advocate!